It matters—in a whole bunch of ways. Body weight is irrelevant. The pursuit of losing it, gaining it, maintaining it or otherwise manipulating or measuring it is utterly disconnected from a healthy, fit, nourished life. The non-thinking, mostly unchallenged idea that it’s connected is leading the vast majority astray. Focusing on “weight” is the one of the most basic, insidious, and widespread mistakes in attempts to become lean or healthy. It leads people to eat in ways that are not sustainable, not pleasurable, and not even what would necessarily be defined as “healthy eating.” It leaves many quite normal-weight people still not feeling and looking their best. And it leaves many people who do carry excess fat looking at a number that is not measuring their excess fat. All of these (not looking or feeling great, excess body fat, poor health and disease) are problems. But WEIGHT is not the issue with any of those! Conflating weight with health or healthy eating or a fit life is wrongheaded, fuzzy, sloppy thinking and semantics. It rarely leads to clear results. Eating well/healthy eating and “losing weight” are not even necessarily the same pursuits at all! They can actually be at cross-purposes. First of all, when you lose undefined “weight,” often by depriving yourself of enough fuel to function well, you get exactly what you asked for. You lose “pounds.” The question is, pounds of what? The weight-loss movement of the last 40+ years has never clearly distinguished this—and still doesn’t. Historically, the dieting world has mostly been happy to part with “pounds” without a care for what they’re composed of. When I first began fueling my body many years ago (over 20 years ago now, in fact! ), I actually saw a net gain in my weight, yet lost two dress sizes and lowered my body fat from 28% to 17% over the same period. People who experience no “weight” loss or even “weight gain” in that same way—and who think “weight” is the issue, and don’t understand that all “weight” is not fat—are dismayed, and often resort to health-damaging tactics to lower this number. Yet this number is not telling them a thing about their health or fitness. Many “diets” are designed to deprive your body of fuel, with the thought that if you create a void by consuming less fuel and driving the machine harder, the body will automatically choose fat to fill that void. Then, goes the simplistic reasoning, you’ll lose “pounds” (of fat, you hope/mean—though you say “weight”). The problem: that’s not necessarily what happens. Fat alone can’t make up the deficit you create by “eating less and exercising more.” The body cannot run on fat alone. Carbohydrate is the human body’s primary source of fuel—the immediate source of energy we use constantly to fuel our activity and most of the work of our cells. The body must always have glucose—the carbohydrate found in your bloodstream at all times—to feed the central nervous system. And virtually no fat cat be made into glucose. It’s true (and important to note) that many people don’t need as much carbohydrate they eat. And it’s even more important to know that we don’t need ANY carb in the form of refined flour and sugar (which are the kind many Americans consume way too much of). But we still need some—healthy, complex, whole-food sources. If you don’t eat enough carbohydrate, your body manufactures carbohydrate fuel using existing materials—not fat, but lean muscle tissue. This is your body’s way of making glucose when you don’t keep it well-supplied with the food to do it. Fat is not designed for round-the-clock heavy use, or for fast energy. The use of muscle protein ensures your survival, and you do lose “weight”—because the lost muscle weighs something. Losing pounds of muscle is dangerous and counterproductive. Physiologists William Evans, Ph.D., and Irwin H. Rosenberg, M.D., of the U.S. Department of Agriculture Human Nutrition Research Center on Aging at Tufts University, note: “Muscle, to a far greater extent than most people realize, is responsible for the vitality of your whole physiological apparatus.” Burning muscle for fuel is inefficient and “environmentally unsound,” leaving toxic chemical byproducts in its wake. Organs such as the kidneys and liver are stressed with the task of safely processing and excreting these byproducts. Along with loss of muscle protein comes the loss of other important body proteins. The antibodies that defend you against illness are proteins. Muscle contains enzymes designed to metabolize fats, which are lost when muscle is lost. When your body is struggling to process muscle into fuel, the liver produces more low-density cholesterol, and fat-storage-assisting enzymes build up. Plus, it is impossible to completely break down fat without carbohydrate present. Fat that breaks down incompletely leaves more harmful byproducts behind to join the poisonous “leftovers” of muscle/protein breakdown. And if more than about one-fourth of weight lost is muscle, and/or if the loss is very rapid, serious protein deficiency and electrolyte imbalances can cause heart irregularities, which could result in death. Perhaps most ironic, however, in the context of “weight” loss (when you really mean FAT loss; when you really just want to be LEAN): converting muscle for use as fuel leaves you less lean in the short-term, since you’re losing lean tissue and thus your overall percentage of lean mass goes down. Even more significant, using your own muscle for fuel in an effort to lose fat is counterproductive because it sets you up to gain more fat, and have a harder time losing it, later. Muscle is what scientists call metabolically active tissue. It’s the part of your body that demands fuel be burned—including fat. See how this goes? Doesn’t work. Never will. Weight loss only makes your weight smaller. It’s ironic enough that it doesn’t necessarily make your body smaller. It’s even more ironic that people try to lose “weight” for their health—when many typical “weight” loss methods are one hundred percent removed from being healthy. They are, in fact, damaging to energy and health. Plus—and maybe more importantly—“weight loss diets” are not a life. They never are. They’re a miserable and misguided strategy that will probably make you ultimately fatter, as well as unhappy and wrongly believing that being fit is hard if not impossible. And it’s not! People often say “Muscle weighs more than fat!” Please don’t promote that semantic blunder either. Does turkey weigh more than tofu? A pound of fat weighs the same as a pound of muscle—they both weigh a pound, right? More accurately, a pound of fat takes up more space than a pound of muscle (it’s lighter by volume), so when you lose one pound of it, it really shows. You can lose a great deal of muscle, however, and not improve the size, shape or tone of your body (in fact, it will ruin the tone). You could argue that if I was 5’1” and weighed 750 pounds, that would be a problem. Well, of course. But it would still be a fat problem, not a weight problem. Moreover, we’d probably notice it, even if I never weighed myself, yes? The first way I knew exactly what I had lost and gained was by looking at my body, feeling my strength, and seeing the way my clothes fit. 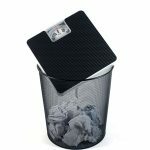 The scale said nothing; six pounds of fat loss happened to occur simultaneously with a gain of almost that many pounds of muscle. I was smaller, “harder” and I could do chin-ups for the first time in my life. Who needed a scale? You think these semantics don’t matter? Listen, as I have, to peoples’ stories. See their confusion, their obsession with this number. See how many “normal” weight people feel awful, and don’t look so great, either. (And don’t know what to do about it except indiscriminately “eat less,” without regard for nutrition, nutrient density, fuel and energy, and quality—which makes them feel more awful.) See, too, how many actually overfat people think they’re safe because they fit neatly onto the range of a height-weight chart. It’s impossible for any chart to identify a weight that is healthy. No matter how low your weight, bodyfat can be high. 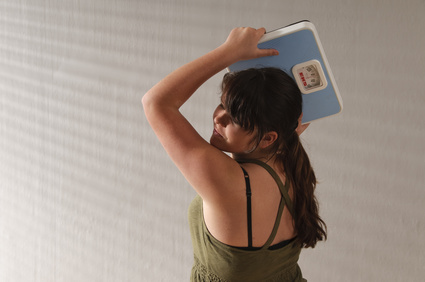 No matter how high your weight, bodyfat can be low. (Okay, again, sure—most 350-pound people do not have low bodyfat, unless they are professional football players.) 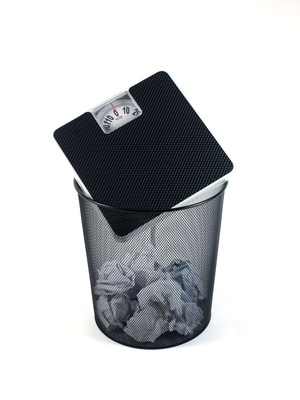 A person could weigh in the “ideal” range with 40 percent bodyfat (not healthy) and a very low lean body mass. Arnold Schwarzenegger does not conform to “ideal weight” charts—yet he is clearly not “fat.” Think about it. Again the bottom line: if you’re concerned about health, fitness, appearance, energy and long life, you can forget about your weight, per se. The health professionals and researchers who say “weight loss” is necessary for “overweight” people mean that fat loss is necessary for overfat people to have better health and fitness. 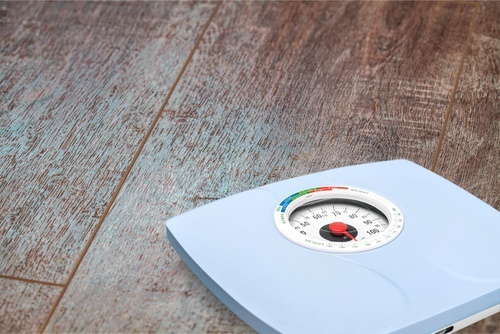 A healthy life involves healthy eating and activity (and other nourishing practices such as quality sleep/rest, and low or well-managed stress)—and none of that needs you to weigh yourself or know your weight. Remember, most of us know if we feel good and look good—and isn’t that way, way more important than an arbitrary number? Isn’t that what you’re really after when you seek to “lose weight?” And if so, why not just make the healthy changes and then go direct, monitoring the deeper results you’re actually after—instead of a data point that will supposedly tell you if you’re there (and really doesn’t)? LOOK. FEEL. SEE. There’s already too much obsession with data minutiae and too little common sense, good judgment, and instinct. Wouldn’t it be great to manage this part of your life without a digital instrument? “Weight loss” and “diets” go hand in hand. They’re both shortsighted and diversionary. They miss the point and the mark. A sustainable, enjoyable, wholehearted and holistic life that’s physically active and includes quality healthy food consumed with joy and smarts—that’s a recipe for a body that feels good, looks good, and works well. Thanks for the update, Robyn. I see this much more clearly now than I did when I first read Bodyfueling. When I was discussing my weight change with my Doctor during my annual physical, he said “your weight only changed by 2 pounds”. I replied “but my body has changed”. My body is much firmer and stronger, and I feel healthier now. The difference is that I am now fueling my body with plant based protein. Keep up the good work, Robyn we need to hear more! Thanks Ed, that’s so great to hear! Robyn, I just shared this article with my friends and relatives on facebook! This is a great time for people to hear this as we welcome the new year!